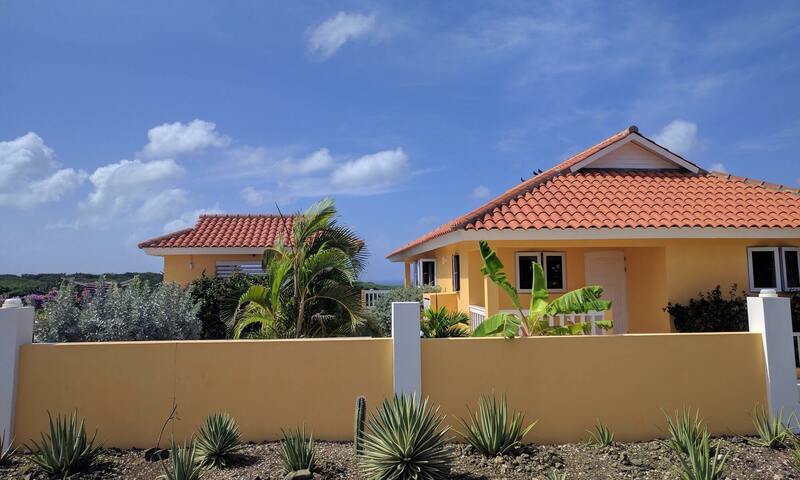 Below you will find the letting prices for Kas Tribon, Curaçao. With the help of the calendar you can check the available periods. If you would like to make a bookings enquiry, email the required period with the number of persons to us at kastribon@gmail.com. We will contact you as soon as possible upon receipt of your request. Bookings are subject to the conditions as outlined in the Terms & Conditions. The starting from price is based on 2 persons For any additional persons we charge € 10 per night. 2 persons per room. (A maximum of 6 people in total). Kas Tribon can be let from 4 nights. For bookings in excess of 5 weeks please ask for our special prices and terms. Included in the price is the use of all facilities as outlined on this website including bedlinen and towels. Water and electric are expensive in Curaçao and therefore not included in the rent. Meter readings will be taken in your presence at time of arrival and departure. Pre ordering of provisions (optional). Requirements to be discussed with our manager and settled upon arrival. Before a booking confirmation is finalised, a provisional proposal can be submitted for your review. The proposal offered will have a validity of up to a week (dependent upon demand and availability). Validity will be agreed beforehand and this will give you the opportunity to arrange flights. Although the villa will not be offered to anyone else during this time, in the event that a second party submits a proposal for the same period you will be given 24hrs to make your final decision. After this the proposal expires and the bookings calendar will show availability. A rental agreement is reached when a booking is confirmed. (Submitting a proposal is not classed as confirming a booking). A booking confirmation will be held for one week and within this period the down payment (25% of the total) has to be received in the account of ‘Kas Tribon’, failing this the booking will expire. Receipt of the down payment in our account will secure the booking. The balance (the remaining 75%) needs to be paid into our account at the latest 8 weeks prior to departure. If the balance is not showing by this date, we reserve the right to cancel the agreement and no refund will be given. The deposit payment will be refunded to your account within 14 days of your return home less the cost of water and electric incurred during your stay and possible other damages that are chargeable to the Tenant. In view of this the villa will be inspected by yourself together with the Manager both at time of arrival and departure and the meter readings will be taken at this stage. From date of down payment until 2 months prior to departure, you will lose the down payment and the remaining balance will not be payable. From 2 months prior to departure – no refunds will be given.If during your stay you need to curtail your holiday – no refunds will be given and we therefore strongly advise you to take out a worldwide travel insurance cover to you in these events. The arrival and departure times can be arranged with the Landlord or the Manager – these are all dependent upon the arrival and departure of your flights and the arrival of the following Tenants. In the villa you will find an information folder with the house rules, an inventory and further useful information concerning the island. Included : Gas usage, beds and bed linen, kitchen /tea towels, bath and beach towels. Not included : final valet, transfers to and from the airport, water and electric usage, cost of welcome hamper (if required), use of telephone and any personal expenditure. Electric – Our advice is to use the air conditioning only when required, so not during the day when the windows are open in the bedrooms or when there is no one at home. Unnecessary use of the air conditioning is the main cause of high bills. Approx cost per KWh is €0,40. All water in Curaçao is sourced from seawater and is therefore quite expensive. (approx. € 7,00 cu.m). You are requested to be frugal with water. Prices quoted are just an indication and are reviewed by the suppliers at monthly intervals. Your car has to be parked on the drive and not on the road. Life on Curaçao is predominantly outdoors where smoking is allowed. Smoking in the villa is not allowed and the use of drugs (with the exception of those medically prescribed) in and around the villa is strictly prohibited. If detected a fine will be passed on to the Tenant as the use of drugs is against the law in Curaçao. It is not allowed to light fires in or around the villa with the exception of the use of the BBQ on the terrace. Sole use of the villa is as a holiday let and the Tenants need to be aware of the rules and regulations applicable to luxurious residential areas in Curaçao, i.e. Respect the presence of fellow residents and refrain from any kind of antisocial behaviour. Written permission from the Landlord is required prior to organising large parties or gatherings. (Consult the Manager if in doubt). It is not allowed to sublet the villa to people other than listed on the bookings form. If it becomes apparent that more or different people than booked reside in the villa, the Tenant will be charged twice the rate for these for the total of the rental period. It is prohibited to make video recordings in or around the villa for commercial use without written consent from the Landlord. The landlord can never be held liable in any form whatsoever other than in the event of a double booking for the period in question. If the villa is not available for the reserved period due to a double booking, the landlord will refund the rental paid in full as well as any additional expenses incurred by the tenant in seeking alternative accommodation. The re-imbursement of these costs (up to and not exceeding the maximum tariff charged by Kas Tribon for the rental period in question) will be made by mutual agreement but never for a longer period than the original booking. We strongly advise you to take out an appropriate travel insurance policy, which will cover additional expenses that may be incurred. In the event that the villa cannot be let due to damage caused by acts of nature, fire or other unforeseen circumstances , the landlord will return all monies paid as soon as possible. This will terminate all contractual obligations.